A delicious classic with a fresh, summery twist. Preheat the oven to 150°C, 300°F, Gas Mark 2. Divide the berries into six ramekins, 7.5 x 4 cm (3 x 11/2 in).Place the cream and milk in a saucepan and slowly bring to the boil. Meanwhile, in a large bowl, mix together the egg yolks and condensed milk. Remove the cream and milk mixture from the heat and whisk into the egg yolk mixture. Pour over the berries in the ramekins. Carefully place the ramekins in a deep roasting tin and fill the tin with enough boiling water to come two thirds up the sides of the dishes. Cover with foil and bake for 40 minutes until just set. Remove from the oven and place the ramekins on a rack to cool. Chill well. To glaze the brûlées: preheat the grill to its highest setting. 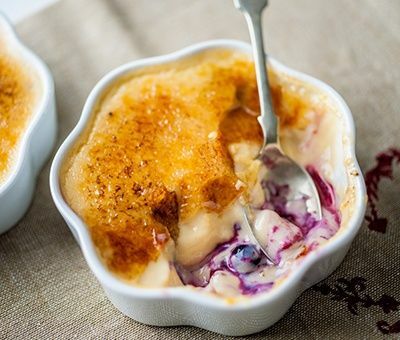 Sprinkle a thin layer of caster sugar over each dish, ensuring the custard is covered. Place under the grill for about 5–6 minutes until the sugar has melted to a golden brown. Alternatively, use a cook’s blowtorch. Cool slightly before serving.